Professor Brij Lal is the Founding Director of The Centre for the Contemporary Pacific at the Australian National University (ANU). Convenor, Division of Pacific and Asian History and former Chair of Faculty, Research School of Pacific and Asian Studies. Deputy Director of the School of Culture, History and Language at the ANU. Professor Lal’s research interests extend to, Culture and History of the Indian Diaspora; comparative colonialism and constitutionalism; Fiction, Faction and History Writing; and Asian diaspora. I would like to thank Professor Lal for allowing me to use excerpts from his books and articles. This book is a selection of my essays on the Indian indenture (girmit) experience in Fiji. I have brought them together because there is a demand for them in the rapidly growing Indo-Fijian diaspora in North America, Australia and New Zealand, and among an expanding fraternity of Indian diaspora scholars scattered around the globe. I have been amazed to find the different and complex ways-through songs, music, ceremonies and oral narratives-in which diasporic people retrieve and re-present their remembered pasts and the ways in which they transmit them to the next generation. The past, fractured and reconfigured, survives with a force and tenacity that will gladden the heart of every scholar. If this book contributes a little to cultural rejuvenation in the Indo-Fijian diaspora, and to the ongoing conversation about the nature and meaning of the indenture experience globally, I shall be more than satisfied. The essays reproduced here substantially in the form in which they first appeared, were written in different moods at different times for different audiences, but they have an intellectual coherence, thematic unity and chronology of their own. They show that at one level or another, the girmitiyas were caught between the demands and pulls of two worlds, one which they had left but not completely escaped, and one which they had entered but not fully embraced. They had left one home and, at least emotionally, not found another in their own lifetime. They lived and died in an acute state of tension and ambivalence. They were a people caught in-between, neither here nor there, or else everywhere all at once. These essays will, I hope, help us understand why, by extending and deepening our knowledge of the formative years of the Indian presence in Fiji, exploring the local byways and alleys of an experience glossed over in other investigations. The girmitiyas are gone now, but their imprint is etched indelibly on the landscape of their adopted homes. They were, in fact, a part of a remarkable episode in modern history, units in a grand but ultimately flawed experiment in labour service dubbed by its critics as another form of slavery. Whether indenture was slavery or not is a question that will be debated long after we ourselves are gone; but there can be little argument that it was a harsh, brutalizing experience. The girmitiyas called it ‘narak’ which means hell, an experience which robbed them of ‘izzat’, honour, which denied them ‘insaf’, justice. The words are theirs, not mine. Little was known but much assumed about the social and cultural background of the immigrants. ‘Coolies’ all, they were assumed to be children of the lesser gods, men and women of low status and few means, down trodden or down on their luck, for whom the colonies offered brighter prospects of a better future. Even sympathetic friends denied them agency. 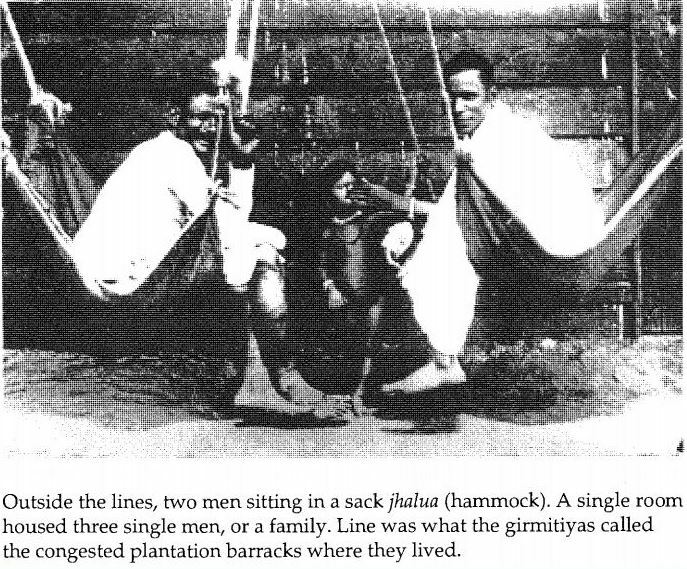 Their employers and the colonial government used negative images to remind the girmitiyas and their descendants of their proper place in the colonial hierarchy, while their friends used them as ammunition for their own political causes. Girmitiyas came late to the attention of historians and other writers, almost a century after the beginning of indentured emigration. Always, in one form or another, they were seen and analyzed as a problem. To the missionaries, their religion was a problem to be resolved through conversion, a project undertaken to various degrees and to various levels of success in the different colonies. To the friends of India around the turn of the century, the girmitiyas and their plight were a blot on the face of India struggling to find its rightful place in the international community of nations. At the time of Indian independence, overseas Indians were seen as a problem in imperial relations. Still later, they were viewed as a problem in plural societies, to be solved through expulsion or political repression or enforced assimilation. But things have been changing in recent years. 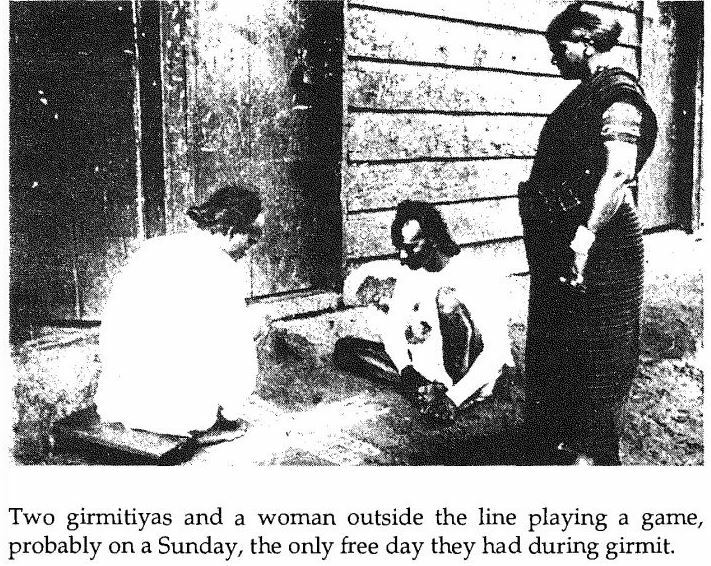 Scholars, many descendants of the girmitiyas themselves, are moving away from the morally charged indenture-as-slavery paradigm to looking at the lived human experience of indenture, exploring the complex and varied ways in which the girmitiyas negotiated their way in the new environment, the way they lived, worked, felt and thought about their predicaments, fashioned new relationships based on a remembered past and the new realities they encountered, resisted and accommodated themselves to the demands of the plantation regime. The reading of indenture experience is complicated -problematized-by new approaches and perspectives. One significant development in recent years has been the gendering of indenture history, removing the veil of dishonour which has hidden the sorrows and accomplishments of women as individuals in their own right, as victims of sexism and racism on the plantation frontier. Another development of note has been the acknowledgment of the vital role of culture, both as a tool of survival as well as an instrument of resistance. I would be happy to see my work represented in this volume as a part of this new research trend. This book also represents a closure of sorts, ending a journey I began more than two decades ago. In 1977, I went to The Australian National University to do a doctoral dissertation in history on the social origins of Fiji’s indentured migrants. The topic came to me naturally. I was born and grew up on a small sugarcane farm in rural Vanua Levu. My grandfather was a girmitiya who had come to Fiji at the turn of this century. Every so often other girmitiyas in the locality would come home, smoke huqqa and reminisce about their salad days in India or about their experiences and (mis)adventures in Fiji. These re-unions were deeply moving moments. The girmitiyas spoke a language none of us understood, and their dress – kurta and dhoti and pagri, a shawl wrapped around their closely cropped heads- set them apart. They seemed a strange group to a little boy, alien, incongruous, indifferent to their surroundings, hankering for a life they could never reconstruct though they never gave up trying. My curiosity about them grew with time. So it was natural that for my dissertation topic, I chose to solve a mystery of my childhood. The research took me to India for a year, to the archives and libraries and to the villages and towns from where the migrants had come. I have tried to relate some of that experience in the second chapter. It was a hard but also a rewarding year for me. The thesis got written and my first book presented a summary of the results. Then, teaching commitments and changing circumstances led me to more contemporary political topics. Still, while at the University of Hawaii in the mid-1980s, I managed to continue my investigation into the social and cultural history of indenture, from which came papers on the experience of women on the plantations, death and suicide, and resistance and accommodation. Political turbulence in Fiji from the late 1980s to the mid-1990s drew me back into contemporary debates, including an appointment to the Constitution Review Commission, which forced me to suspend the research I was once again beginning to enjoy. But with the completion of the constitution review work, I returned to the subject, this time in the lively company of bright honours students, some of whose work is represented in this volume. Their genuine interest and enthusiasm encouraged me. For this they have my heartfelt thanks. Every journey, however bountiful and exhilarating, must end somewhere, and as far as the history of the Indian indenture experience in Fiji is concerned, mine ends with this book. I realize now as I look back that, the number of pages notwithstanding, I have only just scratched the surface of what is simply a vast, inexhaustible field. There is just so much more to do-on the experience of the South Indian girmitiyas, for example, which deserves a book length study of its own, or the hopes and expectations of minority cultural and religious groups on the plantations, the pressures and demands on those who administered the system, health and ill-health, violence. Old evidence viewed with fresh eyes and probed with new questions will yield new results and provoke further research. 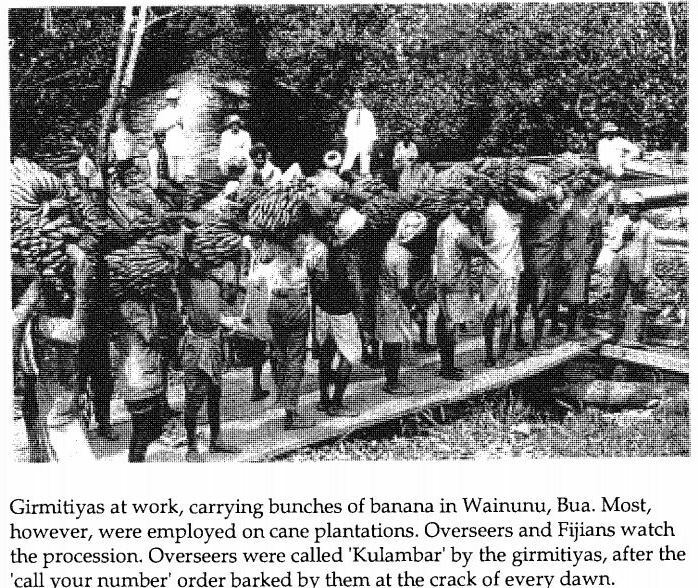 It will be interesting to find out how the Fijian experience compares and contrasts with the experience of other places which used Indian indentured labour. The story of indenture is full of drama and tragedy, raising issues which will find resonance in other places and historical contexts. How does a subaltern group, powerless and isolated, cope with the demands and expectations of the dominant group? How and in what ways does an immigrant community, illiterate and leaderless, cut off from its source and cooped up in a hostile environment, reconstitute itself from the surviving fragments of culture and memory? Questions and more questions, but now for others to pursue. I would not have been able to embark upon this journey, let alone complete it, without the love and support and encouragement of so many people along the way. They are too numerous to thank individually, but some debts must be acknowledged. First, my parents. Both were children of girmitiyas, simple rural folk, uncomplicated and unlettered, though late in life my mother had managed to pick up enough rudimentary Devanagri script to get through a grade one reader. My father never did, always affixing his thumb print to official documents. They were members of an improving generation, but were by no means well to do. Nevertheless, they invested whatever they could save in the education of their children. There was no future on the farm for all the six boys, we were told, and that provided an added incentive for us to do well at school. We did. As the first one in the extended family to go to university, I was expected to choose a socially worthy, financially lucrative profession such as medicine or the law. Doctors and lawyers were the holders of real status in the community, and always in demand. The pressure came not so much from my parents as from relatives and members of the village who wanted to have their ‘own’ doctor or lawyer as a collective symbol of progress and achievement. They were disappointed when I chose the arts, but I said that my arts degree was just a stepping stone to an eventual legal career. My parents said nothing. They stood by me as others made derisory remarks about the uselessness of the subjects I was doing at university, about how only no-hopers did history. My mother died before I began my academic career, but my father lived long enough to see some of the fruits of my work, of which, I think, he was proud, although he never spoke to me about it. Nonetheless, one of his most beloved possessions was a copy of my first book, Girmitiyas, which has a picture of his parents in it. He kept it alongside important family papers in a green tin box underneath his bed. I have been told that he was flipping through the book, looking at the picture of his parents, and crying a few days before he died. Children can never repay the debt they owe to their parents, so I will not try. All that I can do is to pass on to our own children the precepts they imparted to us, to live with your head held high, with honour and self-respect. And my mother’s home-grown wisdom that no matter how thin she made it, roti-Indian leavened bread-always had two sides. I also want to thank my teachers who not only taught well but also inspired us to look beyond the village horizon. They detected and nurtured a talent that we did not know we had. I recall with particular fondness Mr Subramani Gounden, the rotund and bald head master of the Tabia Sanatan Dharam Primary School in the late 1960s. A tough disciplinarian who did not hesitate to apply the tamarind ‘chapki’-thin branch-to our tiny bottoms when we were caught stealing mango or guava from the school compound, he worked hard to ensure that we passed the dreaded Entrance Examination with marks good enough to secure a scholarship for secondary education. Regular night classes, extra lessons on weekends, loads of homework: we virtually camped in the school for three months before the finals. We all passed, and passed well, thanks to Mr Gounden. He is gone now, but not forgotten. In secondary school, we had a brilliant array of freshly graduated teachers, not much older than us, and full of enthusiasm and energy. Three stand out for me. The first was Krishna Datt, our history teacher, slowly balding, thickly bearded, and handsome. He introduced us to the great events of modern world history-the unification of Italy and Germany, the causes of the First World War, the emergence of Asian nationalism, to Garibaldi, Bismark, Mao and Gandhi. He read to us passages from the books of Denis Mack Smith, the great historian of Italy, the English historian of India Percival Spear, and the contemporary historian Geoffrey Barraclough. He introduced us to student politics by organizing a Students’ Council. But my most enduring memory of him is of the day he arrived in class with a large placard around his neck bearing the opening words of the Communist Manifesto. Krishna, now big and Santa Claus-like, is a Labour member of parliament. Vijay Mishra, presently a professor of English in Canada, introduced us to the pleasures of English literature. With a fluent command of the language, a well tended goatee beard and flamboyant clothes, he cut a striking figure. He started a class library of classics which each of us had to read and talk about during the ‘morning talk’ period everyday. We read, while still in grade eleven, novels by Patrick White, Jane Austen, the Bronte sisters, Charles Dickens, D.H. Lawrence, George Eliot, Thomas Hardy, John Steinbeck, Ernest Hemingway, Graham Greene, William Golding, and many others. With Vijay we began to cherish the pleasures of the imagination. When he left, Subramani, now professor of English at the University of the South Pacific, took over. He was more reserved, reflective and moody, but no less effective as a teacher. To Vijay’s list he added Joseph Conrad, whose Lord Jim he dissected for us with great brilliance. My most enduring memory of him, though, is of the day he played for us in class a gramophone record of T.S. Eliot reading his ‘Love Song of J. Alfred Prufrock’. The words of that poem still ring in my memory. By the time I finished high school, I knew I was hooked on the humanities. At the University of the South Pacific, recently opened and keen to impress its seriousness as a place of higher learning, I encountered teachers who nourished our intellectual appetite. Ron Crocombe, lively and energetic, made history come alive with his intimate, anecdotal knowledge of Pacific people and events. Ahmed Ali introduced us to the experience of colonialism from the perspective of the colonized. Walter Johnson, the great American historian, taught the history of the civil rights movement with stirring passion. But my best history teacher, without doubt, was June Cook, a middle-aged, chain-smoking English woman. A Cambridge graduate, she had worked at the United Nations before coming to the Pacific. She taught us the history of European expansion and of the Spanish empire. Why the latter, I have no idea. She read her lectures, word by word, perfectly balanced sentences, perfectly timed, with great authority and clarity. She did not compromise her standards. I somehow felt that she was talking to us the same way she would have talked to students in England or the United States. She expected us to raise our standards. We did. June detected a talent for history in me, and urged me to leave the Pacific-it was too small, too much on the margins, too poorly documented, I was destined for bigger things-and specialize in European or Asian history at a good English or American university. For a while, I toyed with the idea of studying European fascism in the inter-war period, and even corresponded with Marjorie Jacobs of the University of Sydney! June’s personal interest in my future and the belief that I could amount to something pushed me on. I have never met anyone quite like her. And she was the one who persuaded me-insisted actually-that I give up the idea of law as a career. Thank you June, wherever you are. All these people in their own way provided inspiration, guidance and encouragement. I learnt from their example that teaching was a noble profession, that a life devoted to reading and writing was not a life wasted, that making a difference was somehow more satisfying than making a quick buck. For this and much more, I am more grateful than I will ever be able to express. Closer to home, Padma has been my companion, supporter, critic and encourager from the very beginning. Without her, there would have been no journey to undertake. I need say no more. But I want to dedicate this book to Ben, my brother, who died unnaturally young. He was among the kindest, gentlest, most generous human beings I have ever known. He was gifted, wise beyond his years; and he knew the meaning of pain. He sacrificed so much of his own so that we-not only his younger siblings but also nieces and nephews and other children from poor homes in the village and the community at large-could complete our education. To him, alas, my debt will never be repaid except in the memory of the heart. To the people who have assisted me in the production of this volume, I offer my sincere thanks. They include Jude Shanahan, the resident artist and word processing expert in the Division of Pacific and Asian History in the Research School of Pacific and Asian Studies at The Australian National University, to whom I am grateful for many things, but on this occasion especially for designing the cover and preparing the volume for publication. Carol Taylor helped with the technical production of the manuscript. William Copeland at the Fiji Museum reproduced the historical photographs. Kate Vusoniwailala, Director of the Fiji Museum, encouraged me to complete this project which, she said, would contribute to the Museum’s plans to reach out to the Indo-Fijian community whose history and heritage she is keen to give more focused representation than in the past. I applaud her vision and wish her success. Doug Munro has been a helpful and constructive critic over the years. He encouraged me to put my essays together. I am grateful to him for that as well as for his own words in the book. I also acknowledge Aubrey Parke’s interest in the making of this book. Aubrey was District Commissioner Northern in the late 1960s when I was completing the last years of my primary education. He has read my words with care and understanding and a critical eye. His affection for this Labasa kisan’s boy is warmly appreciated. Vinaka Vakalevu, Dhanyabad, Thank you. A final word about the title of this book. An exact translation is impossible, so I have translated ‘chalo’ as ‘let’s go’, and ‘jahaji’ (from jahaj-ship) as ‘my ship mates’. It could just as easily have been translated as ‘let’s move on/leave, my fellow travellers/friends’. Whatever the words, the sense is of a shared, open-ended physical journey to some distant place, across the seas, over the horizon. Some Indo-Fijians were barely able to suppress an embarrassed laugh when I told them the title of the volume still in preparation. They reacted as if they had been reminded of some vaguely mirthful misadventure of long ago. ‘Jahaji’ is a word of a bygone era, and’chalo’ is colloquial, rough, rustic equivalent of the standard Hindi ‘chalen’ or ‘chaliye’. Their reaction is symptomatic of the general Indo-Fijian ambivalence about their past. They have moved on in the world, made something of themselves; they do not want to know, or be reminded of, the sorry circumstances of their forebears and the long distance that the community has travelled since girmit ended nearly a century ago. For them, the past is past. There is no need for literary or intellectual engagement with it. There is no consciousness of history in the community and, sadder still, no urgency to know about it-sad because Indo-Fijians place so much store by education which has made them what they are. I hope this volume will contribute in a small way toward reversing this trend. By showing that girmit is a site of inspirational, not embarrassing, history. That history matters. That, as Francis Bacon said so long ago, ‘the best prophet of the future is the past’. Picture courtesy of: Lal, Brij V. Chalo Jahaji. Acton, A.C.T. : ANU E Press, 2012. Print.